Unit 3A of the Plaza San Luis Complex in Intramuros was built to be a hotel room that never panned out, thus its compact space. It is tucked well within the vast plaza filled with an impressive array Spanish Colonial houses, that walking towards the unit would make you feel like you’ve been transported back to the Spanish colonization era, small among the labyrinth-like massive archways. It is only when you see the well on the far end of the Casa Manila fountain that you’d know you’re still in the right place. 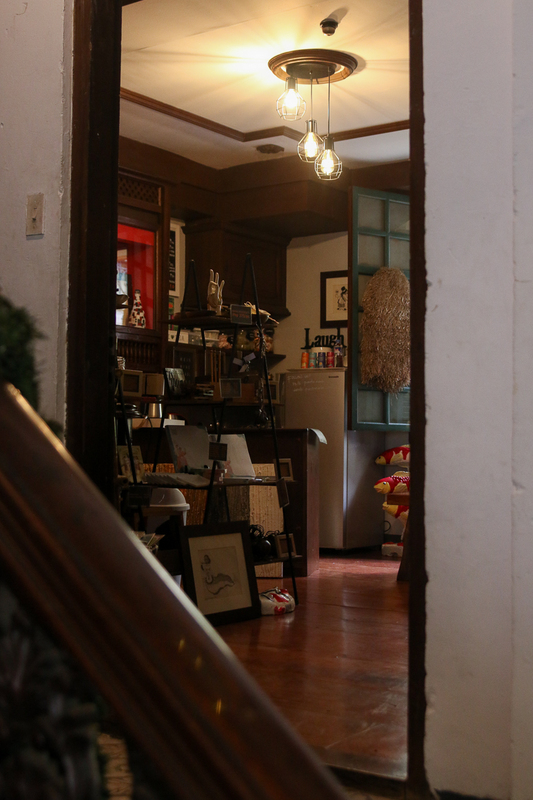 Turn right and you’ll see a couple of stairs, which leads to Unit 3A, now housing a local craft shop, café, and art hub called Puesto Manila. Puesto replaced La Monja Loca, a gift shop ran by performance artist Carlos Celdran, as the unit’s tenant in October 2018. 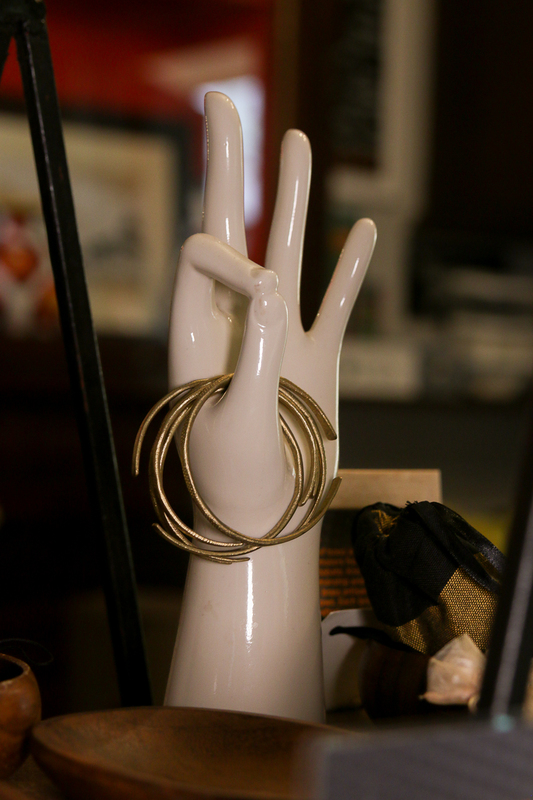 Since then, Puesto has been emerging as a retail shop for everything locally made—trinkets, books, accessories, cards, you name it. 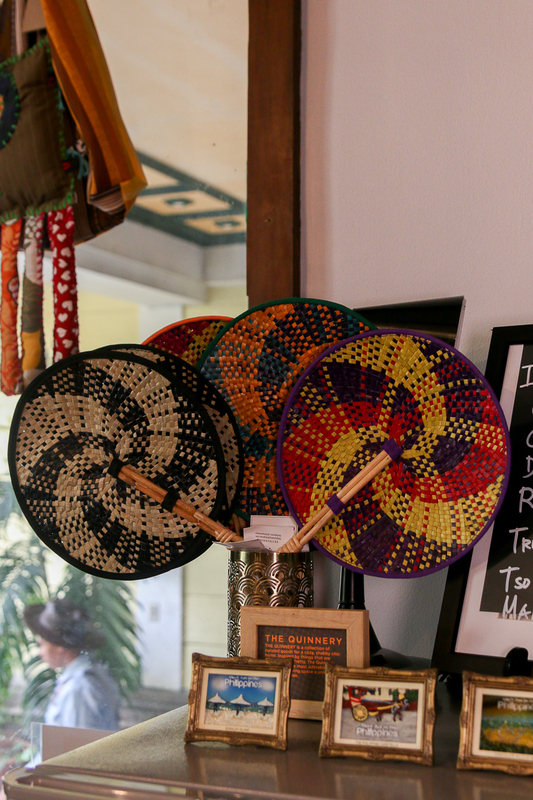 Enter the store and shelves of handmade trinkets (along with information cards of their origin) will greet you. There are organic bath bars, which were made by farmers of Bukid ni Bogs and Umaleng Farm from the province of Dumingag, Zamboanga del Sur, handwoven round abaniko from Manila-based home decor shop The Quinnery, and brass bracelets from Nawa.ph handcrafted by casters from a community in Lake Sebu, South Cotabato. A portion of Puesto’s proceeds from the sales of these brass bracelets from Nawa.ph will go to the Lake Sebu School of Living Traditions. It’s an NGO committed to preserving the culture and traditions of the T’boli tribe. 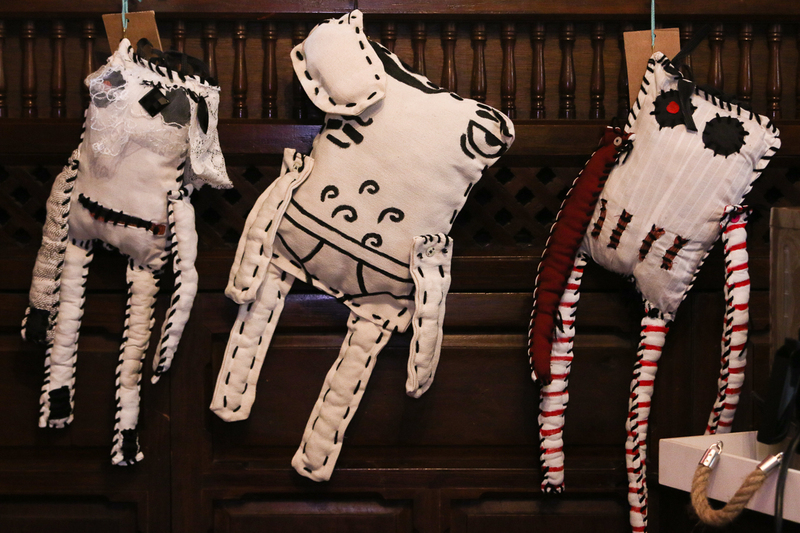 One of Puesto’s consigned items that would pique your curiosity the most are these dolls (said to be called “Monster Nibbles”) which are made of 100 percent recycled materials. These are crafted by designer and illustrator Donald Foronda for his shop Dane and Zade, which advocates for environmental protection. Occupying one side of Puesto is a long hardwood table filled with books, stickers, cards, and everything related to craft. The cards here, however, aren’t the usual ones you’ll find in common souvenir stores. Take this postcard from Pop Cards Manila, for example. 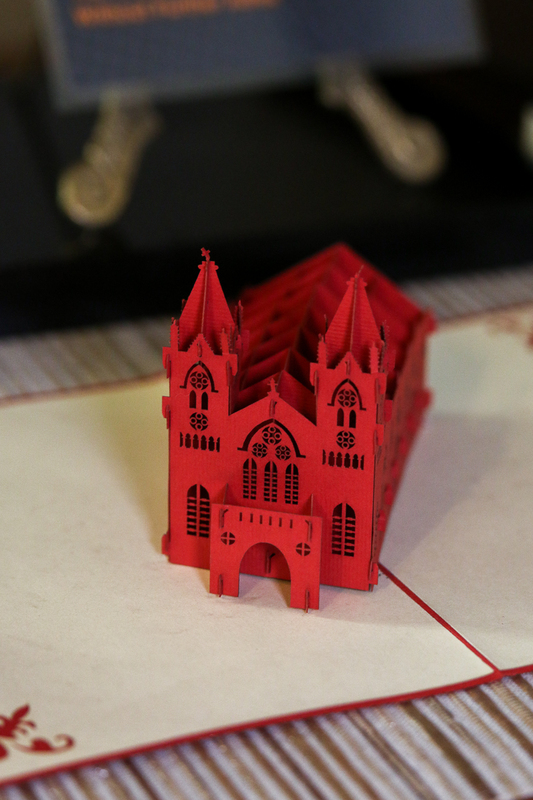 It has been intricately cut and designed to look exactly like the astonishing all-steel San Sebastian Church in Recto, Manila—unique and filled with rich local flavor. 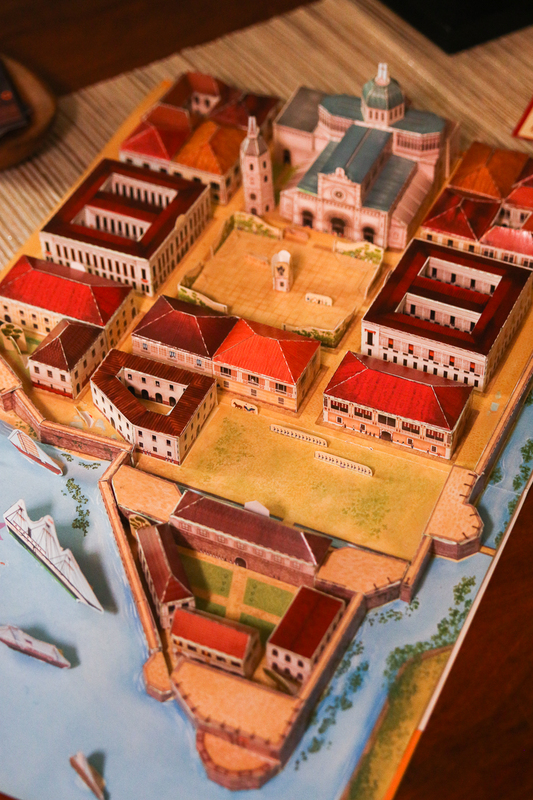 Puesto is also selling the Intramuros 3D Paper Kit which is a historically accurate paper-cut model of the walled city designed to be cut and built piece by piece. 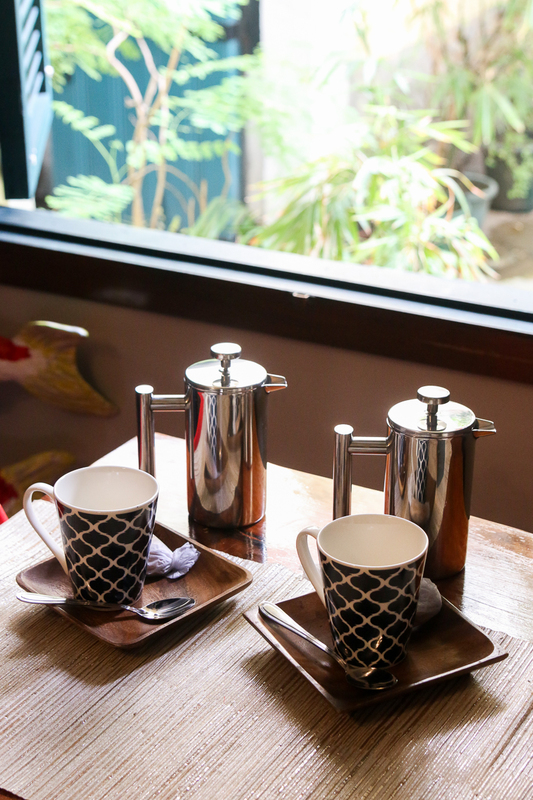 On the other end of the hardwood table is a space for those who might want to stop and drink freshly brewed coffee while overlooking a big window facing the quaint scenery of one of the plaza’s Spanish colonial house replicas. Puesto is not, however, limited to the shop and café. Displayed around Puesto’s walls are paintings and sculptures by local artists. It turns out Puesto also holds art exhibits, their first being the sculptures by self-taught artist Jun Filamor. It ran from Nov. 10 to Dec. 2. As Puesto’s managing partner Benjamin Canapi put it, their vision for the shop is to be a creative space for all kinds of creative minds. “The selling, the coffee, and even the tours are secondary. Our goal is to cater a space for the creatives. 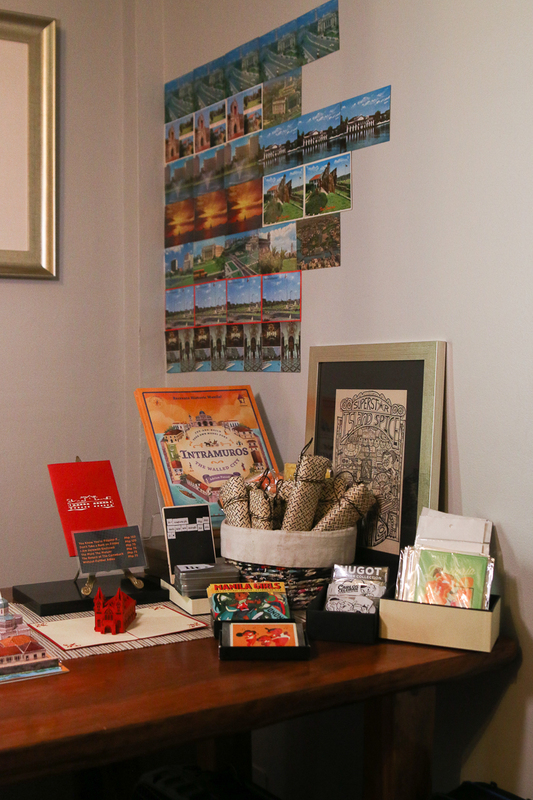 “Basically when we first came here, we weren’t really keen on focusing on souvenirs. The doors and architecture is not really retailing type [given that] the rooms were supposed to be hotel rooms,” Canapi told Nolisoli.ph. 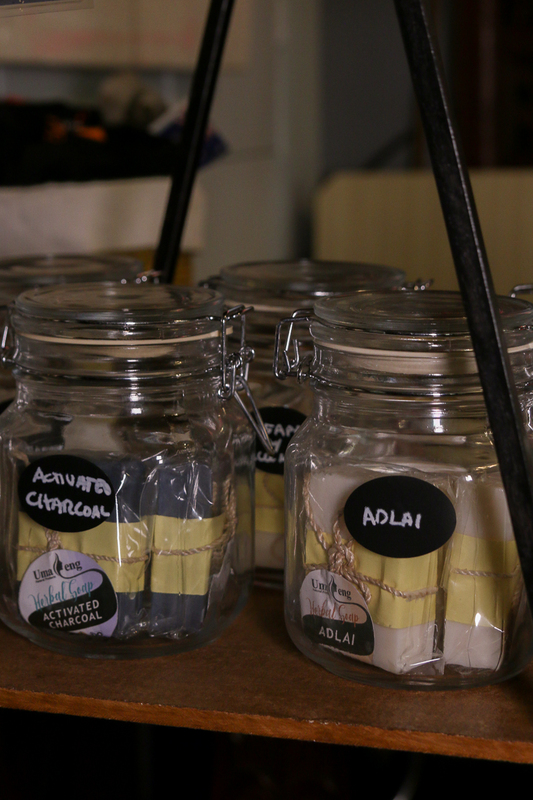 However, as they were building the creative space, they decided that they still want it to serve as a platform for local craftsmen. “Setting up a business in this country is not easy, so at least we’re giving local craftsmen opportunity with our space,” Canapi said. This means if you’re planning to hold an art workshop (or any workshop for creatives, for that matter), you can tap them. If you want to stage an intimate live performance, you can talk to them. If you’re a local craftsman, you can consign with them. The core of Puesto is to revive and boost the arts and culture community, which is perfectly fitting for a historical area like Intramuros. 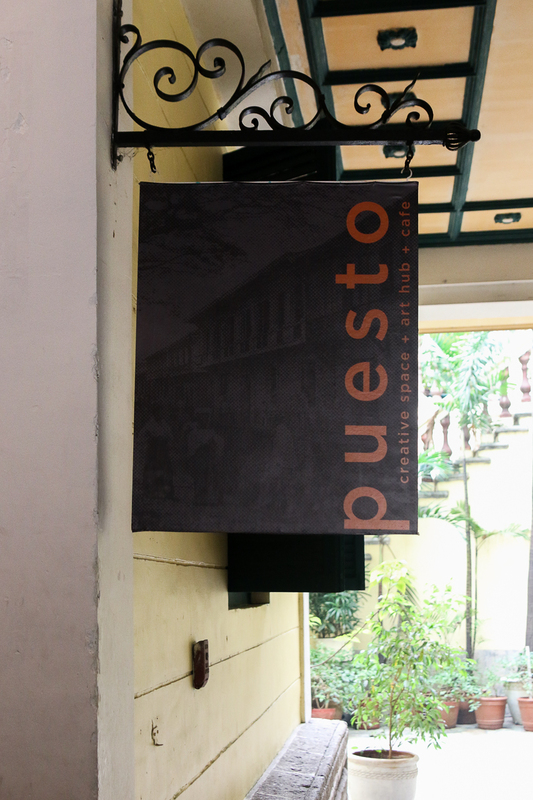 Puesto Manila is open from Wednesdays to Sundays, 11 a.m. to 6 p.m. It is located at Unit 3A, Plaza San Luis Complex, General Luna St., Intramuros, Manila.